Hey Costco, what's going on? How are things in the world of multinational conglomerates? I ask because I've tweeted & posted to you guys on Facebook but have yet to hear back. Are you OK? I'm sure you are doing just fine and are just to busy to reply. Speaking of doing OK, you know who's not? Hundreds of dogs who have been eating treats from your shelves the past few years. You know how I know they aren't doing well? Because they are dead. Perhaps you've been too busy to even read the data. Here is a great summary from the CBC. Now that you've read the information and first hand accounts from parents of dogs who have died of renal failure and from veterinarians where do you stand? Yes, you may say there is no conclusive proof that the treats you shelve are the direct cause, and that dogs die of renal failure every day. Apparently both Petco and PetSmart disagree, as proven by their refusal to take a chance and ordering the removal of the treats, a decision to be lauded. Why Costco, are you willing to take the chance as hundreds of dogs die? Let me ask one more question. If over the course of a couple years one of your baby formulas resulted in hundreds of infants becoming afflicted with inner organ failure, would you take that same chance? I think I know the answer to that. 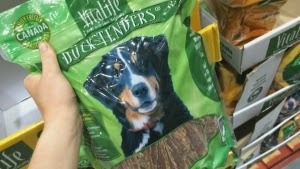 Thank you Costco for telling me, pet parents, and your consumers exactly where you draw the line. Dying children? Remove the product. Dying dogs? No biggie. While we all wait for you to do the humane thing, I have a challenge for you Costco. I would like to see your board members, the ones with pets, feed one of these treats to their dogs every day for the next three months. Why do I have the feeling none will do so?